I live in zone 4 so I grow tomatoes inside the greenhouse. This year we had a real heat wave and now my ripe tomatoes have hard green stripes on the outside and white hard pieces inside. According to what I read on-line this was caused by the sudden high heat. My question is, how do I protect them if we get another heat wave again. A fan or shade cloth, maybe both? They are kind of bland tasting also. Re: Is there any way to protect tomatoes from heat? Inside the greenhouse is not best for them in summer. In zone 4 you may need it in spring and fall, but it just aggravates the heat issues in summer. Are they in containers? If so, bring them out from the greenhouse. Otherwise you are right, fan and shadecloth. Being bland may be just the variety. But if it is hot, you may be having to water a lot. Lots of watering makes them blander as does excess fertilizing. I have shadecloth and made it retractable with some mason string line every 2 ft and some snap rings from the craft store. It is very light so support is not and issue. At the end of this video you can see how easy it is to maneuver. Clever idea. My shade house is just shade cloth, some of it doubled up on a pvc frame on top of my benchmaster. 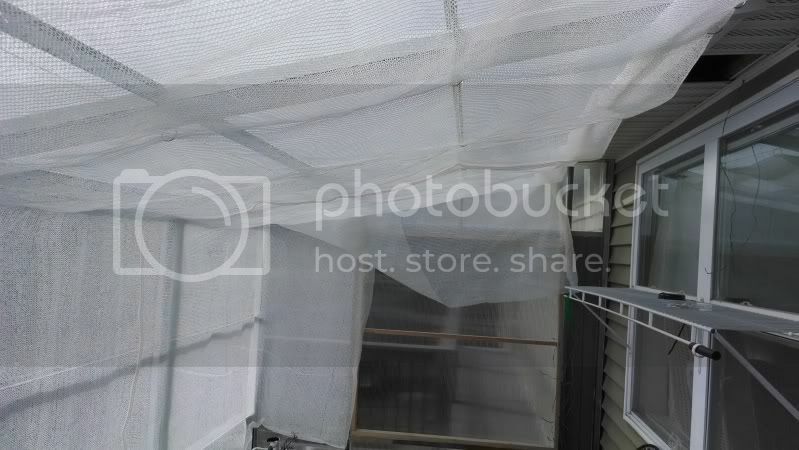 It is not retractable and I tie it with telephone wire to the the frame and fence. If I need more shade I double it up. I am using 47% shadecloth and it is mainly for the orchids and anthuriums. Thank you for the advise. I especially appreciate the pictures and video. DH and I talked it about it and are wondering if ,for the roof section only, we could but Styrofoam panels across every other roof support? Hopefully that would also block some of the heat build-up and then use a light shade cloth around the walls. Would that help or be over-kill? Would it impact air circulation? I was just in my greenhouse. The day is mostly cloudy but it must be 120 degrees in there! I have a kitchen exhaust fan in one wall, a door and high vent in the opposite wall. Everything is open altho the fan isn't on. There is even about a 10mph breeze. It's cookin'! I don't use the greenhouse during the summer, LA47. Years ago, I worked in commercial greenhouses. We grew roses and, altho there aren't many flower holidays during the summer, the plants had to be kept at a reasonable temperature. Big greenhouses like that are essentially swamp coolers. Large exhaust fans at one end of the house, pull air through pads saturated with water at the other end. I don't suppose you are interested in installing a cooling system, are you? I've only thought about it. There isn't much use I could gain from my 120sqft sunshed but I can imagine wanting to use it during the summer months if I lived a few hundred feet higher in elevation. Fifty years ago, there were still greenhouses that had whitewashed glass through part of the year. I remember asking how that was dealt with when autumn rolled around. An old guy told me that mostly, the whitewash just "wears off" from the weather. He said floor brooms could clean the glass if it was still cloudy. I don't suppose that they used the old pioneer whitewash made from limestone and milk but, maybe ... Whitewash isn't very complicated. Don't paint the greenhouse without having some idea of getting it off but it used to be a common practice . I briefly considered growing carnivorous pitcher plants which require pampering in terms of summer and winter temperatures. 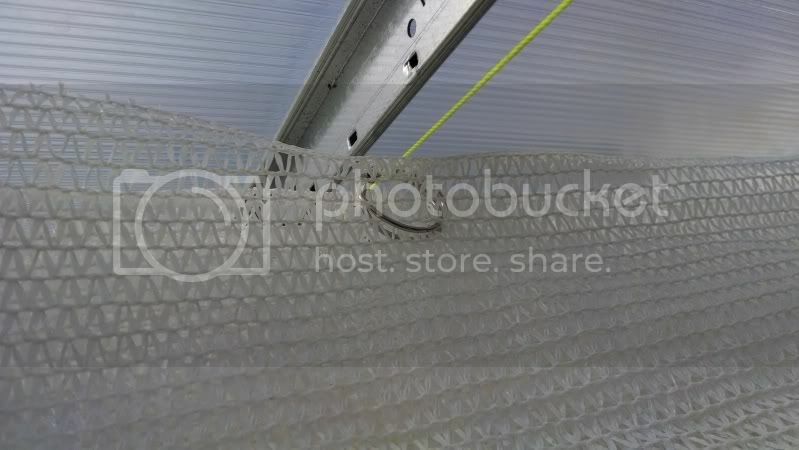 From the videos, dedicated forums, and blogs I have seen, summer greenhouse for nepenthes use swamp coolers fitted in a window or wall opening as digit'S mentioned. Ventilation and fans are also automated and thermostatically activated. Cheapest option I have seen for electric appliances are hot and cold themocube outlet adapters. You have to keep in mind swamp coolers only work in lower humidity. I have good cross ventilation from leaving the door open and a big screened window on the opposite side. I am considering wax operated roof vents that open/close automatically with the temp and no power. 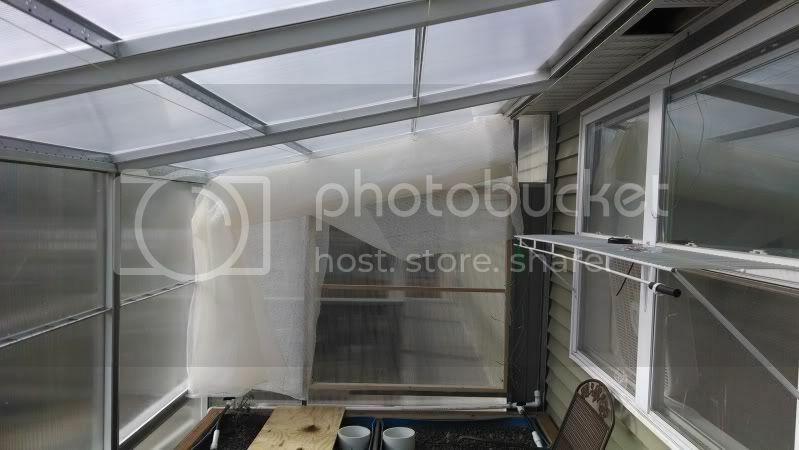 My greenhouse will raise the inside temp up to 40 degrees above outside temp. The shadecloth keeps it around 10 degrees above outside temp on the hottest/sunniest days. I can knock that down close to equal with a fan. Without the shadecloth my plants would fry when it hits 85 outside. We've got the low humidity, Rairdog. It is usually below 20% on summer afternoons. I'm concerned that shutting off half the sunlight may not be a good idea for summer growth. If I understand it correctly, that is an idea LA47 has. It may be adequate. Sunlight is for photosynthesis. Warmth only allows growth. Or, excess heat suppresses it. Shadecloths stop something less than 50% of the sunlight. Yeah, whitewash -- who knows? I think we are going to try the Styrofoam first next year and see if it works, mainly because it is the easiest and most durable. It would cut about 50% of the overhead light but still leave the glass walls at 100%. A friend told us how to fix it so it is easy to put up and take down. If it still happens we'll also add shade cloth on the south side. We have a remote thermometer in the greenhouse so what temperature do we have to start worry about? Also I live at 5800 foot elevation and we've had 2 inches of snow on June 8 one year. Last frost date is June 1st. That's the reason for the greenhouse. Not a tomato greenhouse grower ... altho, you know what, LA47?? I started all my tomatoes in that commercial rose greenhouse ... including, those new releases from the U of I back in the 1970's! Some of those are still around like Kootenai and Benewah . Anyway, those were starts ... the roses were kept below 85Â°. We would turn on an overhead misting system. Whether that sort of thing might be another idea, I really don't know. There was a lot of air movement and the plants always went into night, dry. Heirloom tomatoes that grow good in high heat?